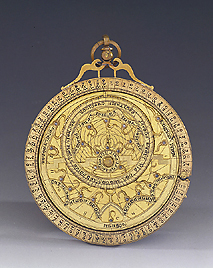 This very small astrolabe is made up of the mater, which contains three latitude plates. Two of these correspond to latitudes of 41 and 42?, and 43 and 44? (Castille and Provence). The third plate has no graduations. The stars on the rete are represented by 22 silver studs. The instrument, which is undated, is from the 13th century, and originates from the legacy of scientific instruments collected in Florence by the Medici family.